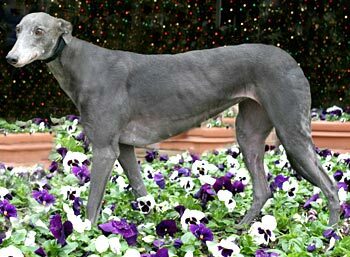 Mimi, aka Merry Mile, is a beautiful, Irish-bred, 7-year-old blue female born September 23, 2002. Her sire is Pacific Mile, and her dam is Mantle Glory. Mimi’s racing career started February 26, 2005, at Lincoln Park, RI, and continued there until March 26, 2007. She was a 2005 American Derby finalist at the Lincoln track. From her racing days she went on to be a brood mom. 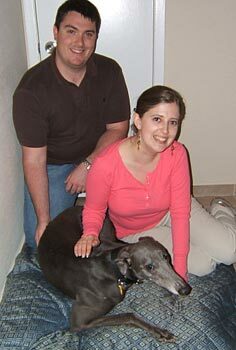 Her first litter was with Kiowa Sweet Trey with 4 pups registered with the NGA that were born July 1, 2007. 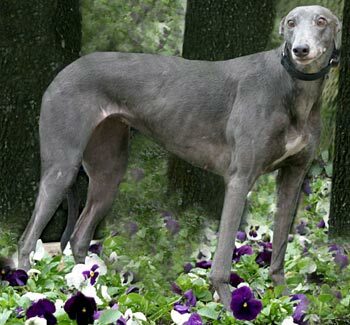 Her second litter was with Dodgem By Design, yielding 6 registered NGA pups born April 5, 2008. All those days are over, and she is ready to find her forever home! Mimi is not cat tolerant and has not been tested with small dogs at this time. 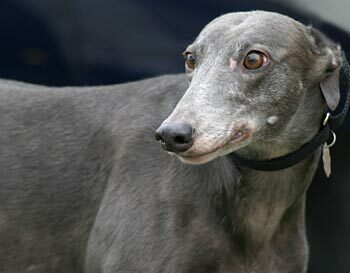 Mimi is an adorable Irish-born girl who, in her career, liked to run long races (660 yards). After retirement she decided it was better to lie on a raised bed on the deck and observe the activity on her property. Even in the cold weather, she will go out through the dog door, settle in her spot, and keep an eagle eye for any squirrels that may appear in the trees. At first she barked at the birds in the feeders, but she soon realized they were invited guests and now she no longer barks at them. Instead, when they scatter, she alertly looks around to see what caused them to fly away – perhaps a squirrel that she can chase? Mimi is not a pushy girl, until I try to put on sneakers - a sure sign I’m going out! Then she does her patented “Mimi Bounce” to show her excitement. She LOVES to go out, whether for a walk or a ride. She leaps into the SUV with no assistance and then finds a dog bed to lie on and rides quietly. Once at the destination she will wait to be invited out of the car before she explores a new area. Mimi must be used to the snow. We had a couple of days so far with an accumulation on the deck and Mimi was the most adventurous dog here. She went out through the dog door as usual, skidded across the deck, and looked back as if to say, “That was fun!” Mimi loves having access to the outside world through the dog door and has been reliably house-trained through the use of this door. Mimi has shown a slight fear of thunderstorms. She does not panic, but will pant and is clearly uncomfortable. During her first storm at night in the house, she tried to climb in bed with me. When I asked her to get down, she found a nice corner in the walk-in closet to hide from the storm. That is now her safe spot during storms. Mimi has also been calmed by the music CD “Canine Lullabies” that features a heartbeat in the background. Mimi loves to chew on treats, particularly the Merrick beef tenders. She usually won’t take treats from your hand, but if you drop them she’ll investigate and decide if she wants them. Mimi has a good appetite, so I have to feed her separately or she’ll help herself to the other Greys’ food. At a recent meet-and-greet we walked Mimi by the cats to gauge her reaction. She was quite interested in the cats and leaned in to sniff through the cage. One of the kitties swiped at her nose. Mimi backed off quickly and wouldn’t look at the kitties again. We’ll have her officially cat-tested though, to ensure that she is trainable with cats. After that failed (from her perspective) encounter, she turned her attention to the ferrets, hamsters, and mice, who were much more lively and therefore much harder to ignore. No animals were harmed in this testing! Mimi has shown herself to be personable and fun-loving, and at times just a hoot! She will be an enjoyable addition to your home, as she has been to mine!